This workpackage is aiming at defining the high level metadata necessary to describe the astronomical data sets on their physical axes, either observed or simulated, for various types of data like 2D-images, data cubes, X-ray event lists, IFU data, etc.. The goal is to provide an abstraction which contains structured information for all these types of data so that discovery and interpretation is feasible in a general framework, and can be used jointly for science cases. The model aims at facilitating the manipulation of heterogeneous data in VO portals. 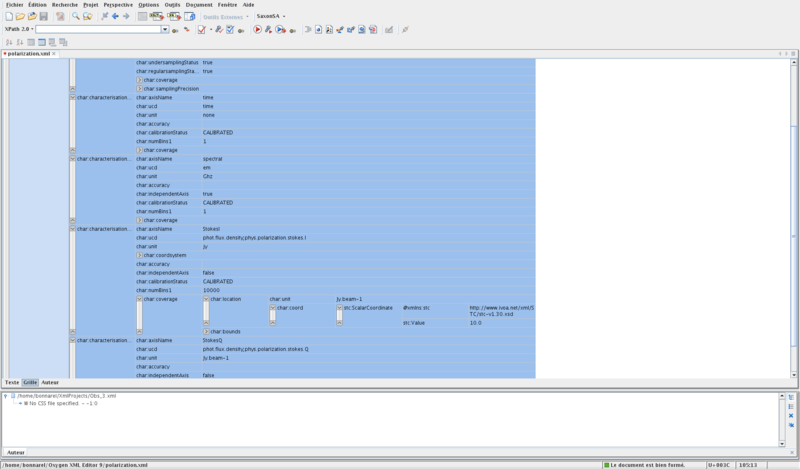 A VO Characterization instance can include descriptions of the data axes, the range of coordinates covered by the data, and information on the data sampling and resolution on each axis. These descriptions are in terms of physical variables, with the specific instrumental signature abstracted away. From September 2007 on, a new effort started to take into account both dissemination of the model in Data centers and completion of the model for some complex use cases. In April May 2008 we started to discuss the issues and Fabien proposed a new definition of the characterisation concept. Discussion on these examples can be read there. The discussion also enhanced the difficulties to implement the data models in services and archives due to ill-definition of some concepts, complexity of xml definition or lack of protocols to transport model-consistent metadata. Summary of the discussion can be found here. Fabien Chereau presented his own views at the baltimore Interop, and some JSON serialisation of the characterisation datamodel has been proposed by T.Boch.